I make homemade bread for my family’s own consumption. I had thought about selling it at a local flea market, and accidentally stumbled into a debate on Facebook where some of the posters had the idea that a cottage Bill had actually become law. After searching the State of New Jersey’s website, I have come to the conclusion that the State has no such Cottage Food Law. A Bill has been proposed and passed in the Assembly however, it is currently in limbo, with an undetermined time as to when it will be heard and voted upon in one way or the other. My guess is the Bill is being held up by lobbyists for commercial bakeries and or kitchens. I have heard of instances where a home-baker who was making and selling beautifully decorated cakes was reported by a disgruntled customer. So, until New Jersey passes a Cottage Law, I won’t be selling any homemade foods, and neither should anyone else. I am currently looking into the requirements of a mobile hotdog cart type of operation through the Camden County Health Department. However, I have no desire to cook with propane, especially after a food truck blew up in Philadelphia a year or so ago. I am happy to report that the fire marshal in the town I live in requires that food trucks using propane must be inspected by the fire department. Now the big question is, do all fire departments inspect them? And the other question is how often? This entry was posted in Food Thoughts and tagged Cottage law, Homemade on May 25, 2015 by acadia2. Today, was the day that we all were free from any commitments and all could get together to go to the Italian Market. Even though it is only 45 minutes away from our house, we don’t go there very often. Today as we were driving through South Philly my MIL mentioned that she was in her old stomping grounds as a child. DH asked her if she wanted to drive by her old house and she did. She lived on Mildred Street and it definitely was not a street that I would care to drive on since it is very narrow. Vehicles park on one side of the street, and each block they alternate the side they park on. Fortunately the street is one way. Anyways, the street is almost not wide enough for two vehicles side to side! The people parked on the side of Mildred Street are practically bumper to bumper, and to me, it looks as though they can’t possibly get out unless they all leave together beginning with the one at the lead. The neighborhood has changed drastically from when MIL lived there. We went to a place that makes fresh pasta and you can watch them roll out the dough and cut it to different shapes. I bought a pound of angel hair, and from the frozen case, I purchased pumpkin stuffed ravioli with abundant filling. MIL purchased ravioli stuffed with mushrooms and DD#1 bought black ravioli stuffed with crab. We also went to a cheese shop that has easy 500 different cheeses, different prosciutto style meats including traditional ham, duck, boar and others. DH likes the potent stinky cheeses, whereas I prefer the mild ones. We tasted all of the cheeses that we purchased. We also bought a bottle of spring water, Soppressata salami and apple pepper jelly. From there we decided to walk West on Christian Street to an Italian bakery where I bought a pound of pignoli cookies and two mascarpone cheese filled chocolate eclairs. MIL bought a peach pastry that looks like a peach but is actually sponge cake filled with a creamy peach flavored filling and soaked in liqueur. On the way to the bakery, we passed a vendor who had morel mushrooms which I screamed in delight over! I said I’d get them on the flip side since I would be back past the vendor on the way back from the bakery. Since I really had no idea as to how to pick out the perfect morel, I just winged it. I selected eight one and a half-inch morels and one three-inch one. The morels in the bin were a mixture of medium brown to dark brown almost black in color. Having never tasted one I didn’t know what to expect. I had heard from my foodie friends that one needed to clean them good to avoid grit or hitch-hikers. My 8 mushrooms cost me $5.85 cents. The guy waiting on me yelled to the back of the garage, “What are morels?” Someone yelled back 35. At that point I didn’t know if that was a sales code or the price, however soon after it became instantly apparent that it was $35. per pound!!! And I was glad I didn’t grab anymore of them. We also stopped at a butcher and purchased an ostrich tenderloin. My Sister-in-law introduced DH and I to ostrich about 7 years ago which is a red meat and tastes similar to beef. So after we arrived home with all of our delectable goodies, I had thawed a sirloin steak to be grilled. I froze the ostrich. Morels are fragile as they spoil fairly fast, so it is wise to eat them as soon as purchased. I decided to saute them along with onions, and garlic in butter. Since it was my first time, I cut them in half-length wise to make sure there weren’t any bugs inside since they are hollow. They were delicious! An earthy mushroom flavor that is stronger tasting then portabella. They do have an odd texture and become soft but not mushy when sautéed. Clean morels thoroughly to get rid of any sand or bugs that hide either inside or in the little crevices. I cut my large one in several pieces so it would cook evenly with the others. Dice onion and microwave it in a microwave safe container for 2 minutes. Stir it and microwave it for an additional 2 minutes. In a skillet on medium high heat, melt butter. Add semi-cooked onion to the skillet and saute it for 5 minutes stirring every 30 seconds or so. Add garlic and saute it for an additional minute. Add morel mushrooms and saute for 5 minutes stirring and flipping them over so they cook on all sides. Sprinkle seasoned salt over skillet. ( I made the morels as a garnish to the steak which helped to enhance its flavor. MIL and DD liked the morels but said she wouldn’t pay that much for them, and DH agreed. I on the other hand, might buy them again for a special occasion as I really enjoyed them). 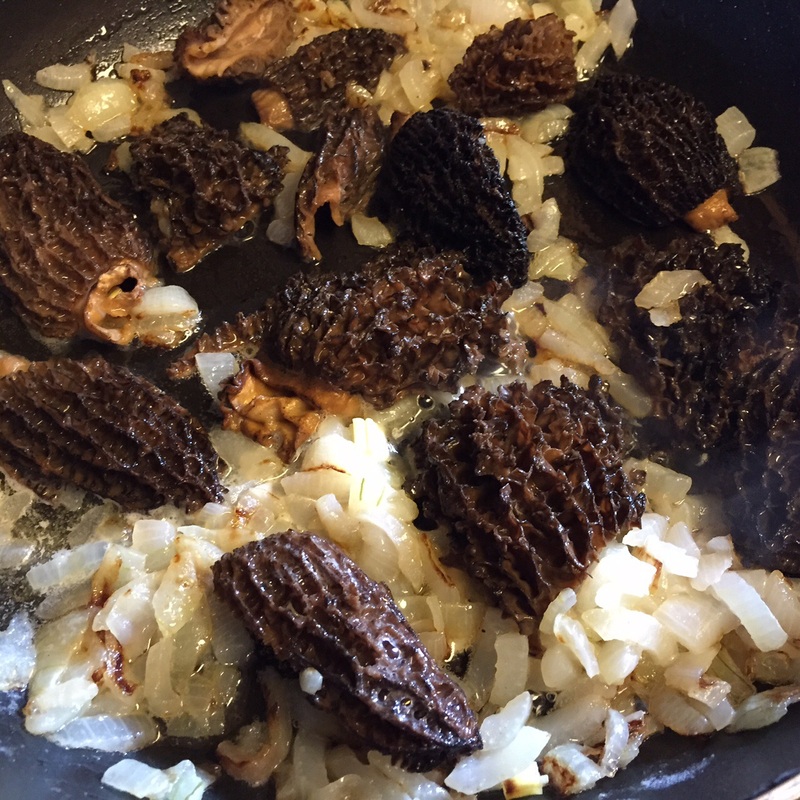 This entry was posted in Food Thoughts and tagged morel mushrooms, morels, mushrooms, Philadelphia, Philadelphia Italian Market on May 4, 2015 by acadia2.